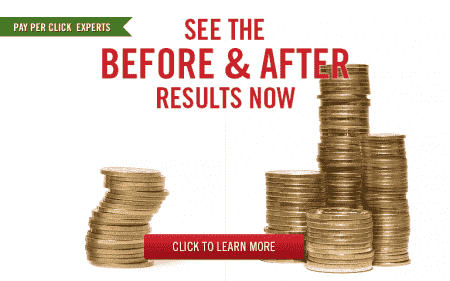 Amazing 2019 Banktuptcy Attorney AdWords Results - As Low As $44 Per Lead! Webrageous has been very successful managing campaigns for bankruptcy attorneys. Here we will highlight the results were achieved for several of our clients. We don’t sell leads on a cost per lead basis but rather manage your AdWords account and strive to obtain the best results possible in your area. Bankruptcy results from AdWords can vary depending on the location and how well a website converts. On average we see between $44 and $56 cost-per-lead (CPL). The cost per lead (CPL) is the cost to receive one contact form submission or phone call. Below are results for two of our Bankruptcy attorney clients. This Bankruptcy AdWords account targets a more rural area than most of our clients. We’ve averaged around $44 CPL since launch and recently achieved $24 CPL. The majority of leads for this client come via phone calls from either click-to-call-ads or the client’s site. Note the steady improvement over time since we started working with this successful bankruptcy law firm. This Bankruptcy attorney’s account targets a midsize metro area. We’ve averaged around $56 CPL since launch. We expect with further optimization to bring the CPL under $50 on average. Metropolitan areas typically have a higher cost per lead than a rural area so that’s why there is this difference between the cost per lead for the 2 clients. Please note that these cost per leads do not include our management fee because that varies depending on your spending. Remember we don’t sell leads but rather work hard to generate the lowest cost per lead. If you’re interested in having a manager Google AdWords account please fill out our contact form or call us at 800-645-9521. Here is a call summary for one of the bankruptcy law firms that we work with. It was for a week in which they spent $337 on paid search. Not all the calls are from PPC (further down you’ll see the breakdown from 2 different PPC campaigns). Notice below there are some repeat callers who have called before. That’s a good sign that people are calling back for more information. 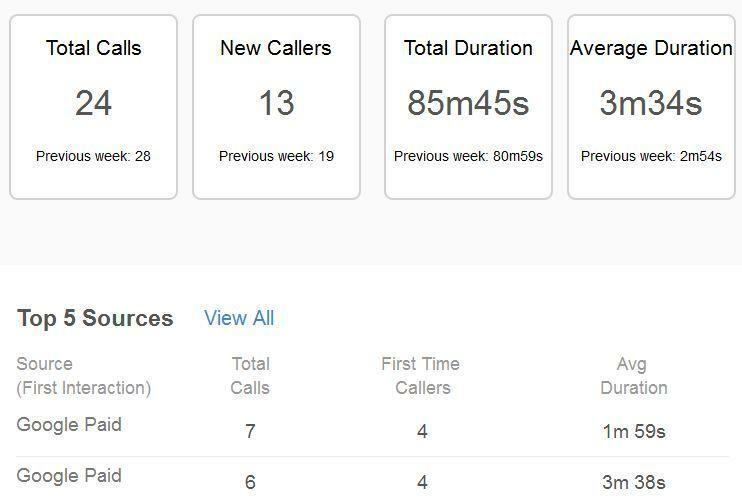 Note also the decent average call length. That’s a sign of good call quality and good keyword quality for the keywords we are targeting with Google AdWords. Now take a look at some data of average call length at the keyword level. This is really helpful insight we are able to share with our clients. This is just data from one week so isn’t as insightful as keyword data that is aggregated over several months. Call length is an indication of keyword quality and can help us optimize your account. Many PPC management agencies don’t go to these lengths to pinpoint both the best keywords and potential wasted spending. If you also have other practice areas you should take a look at our page geared towards personal injury attorneys. Often we can generate leads for personal injury attorneys under $200 per lead. And if you’re looking to also generate family law leads we can usually generate those for between $30 and $80 per lead. If you want to learn more about how we can help you please give us a call at 800-645-9521 .